I had hoped to do this last week but found myself off the grid all week while on holiday. It did mean that I got lots of hand sewing done, but more on that later. So there are lots of round ups with better photos than I have; I forgot to take any! So I'm going for the next best things, the people I met and shopping. 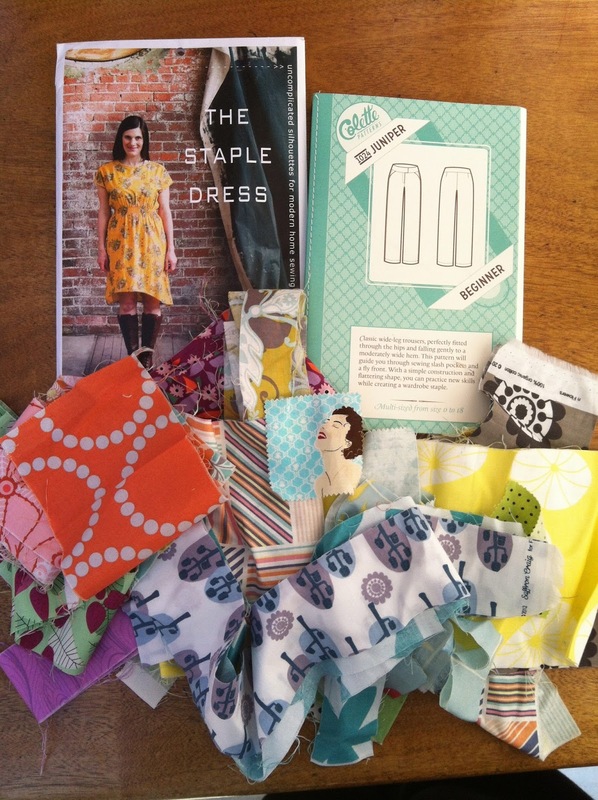 Jenna mentioned The Staple Dress that Mandy had been wearing, and how quick it is to make, and I have been after that Collette pattern for a while. The scraps are for a top I started a while ago, I needed some more variation. Then I met my room mates; Jane, Moira, Angela, Jo and Kate. Saturday; the day of free motion quilting. Trudi was informative and helpful as I machine quilted with hand quilting thread and broke a needle *hangs head in shame* (because for 2 years I advised people on thread use!). Mandy gave me some tips on my curvemaster foot, which, 1 year on and never been used successfully, will be written up to experience as the chance is it's a duff one as I can't fit it onto my machine. And introduced me to Aurifil which did quilt like a dream. I never knew thread could be so involved and I did buy a reel of Aurifil, but only one after Ann told me how much she loves it but her machine doesn't! Rachel had planned to take a group to Shaukat for a quick Liberty fix. I went, but didn't buy as it would have been for a Staple Dress and I wasn't sure of the quantities. I'll be heading back though as the Liberty was extensive and I have plans! Francine and I rushed back for our afternoon sessions and I spent 1 1/2 hours practicing my free motion design. It's interesting how differently you have to think to keep the pen on the page. Every so often I lifted so I started again. There was time after for some for some EPP so I sat at a quiet table with Mandy and others and sewed. Great to read your roundup. If your curvemaster does not fit yuor machine, you may need an adaptor. These are available for most machines. Having said which, I had a curvemaster on my wish list for a bit, but have now managed a technique for curves, pin free! just a bit of practise!It is easier than you expect.